Let’s head to São Tomé and Príncipe: two tiny islands located in the middle of the Gulf of Guinea on the Equator, 200 miles off the coast of Gabon. 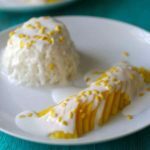 I chose to prepare the most popular dessert of São Tomé and Príncipe: arroz doce or rice with coconut milk. When I cooked my Costarican recipe arroz con pollo, I shared with you that rice was the most important cereal crop in the world and that it was the staple food of more than half of the world population. The oldest traces of rice date back to 5000 BC. They were found in China, in the province of Hunan, as well as in the north of India on the banks of the Ganges. 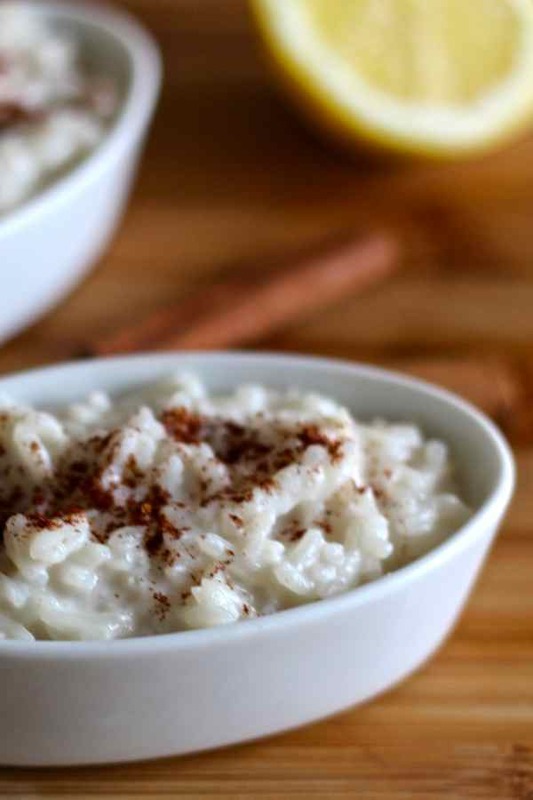 The origins of rice pudding are difficult to identify but are intertwined with those of rice, first cultivated in Southeast Asia. In Europe, rice pudding was prepared for the first time by the Romans with goat milk but for medical purposes. In the Middle Ages, rice was still a luxury product because it was not grown in Europe. When combined with sweet almond milk, this dessert was very expensive and therefore elitist. 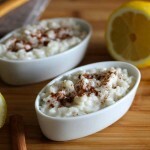 Yet today, rice pudding is a popular and inexpensive dessert. 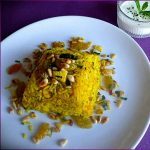 Each country has its own version as rice pudding is very versatile. Mike was the first to publish a rice pudding variant. 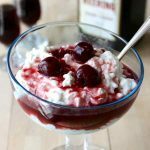 Indeed, remember his risalamande coming straight from Denmark, a relatively rich rice pudding with milk, almonds, and morello cherries in their syrup. In France, it is prepared with vanilla pod infused in milk. Its variants are numerous over there, although the basis remains the same in most recipes. In Portugal, it is prepared with vermicelli, cinnamon, lemon and is called aletria. 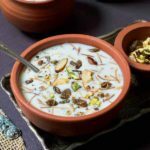 In India, kheer is composed of basmati rice and almonds cooked in milk, decorated with grapes and perfumed with cardamom. 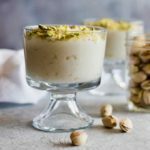 In China, people prepare a version with basmati rice, coconut milk and pistachio. In Sweden and Norway, rice pudding or risgrynsgröt is traditionally served at Christmas. Sometimes, an almond is hidden in the dessert and the person who eats it will supposedly get married before the end of the year. Yes, there are dozens of recipes depending on the country or region. 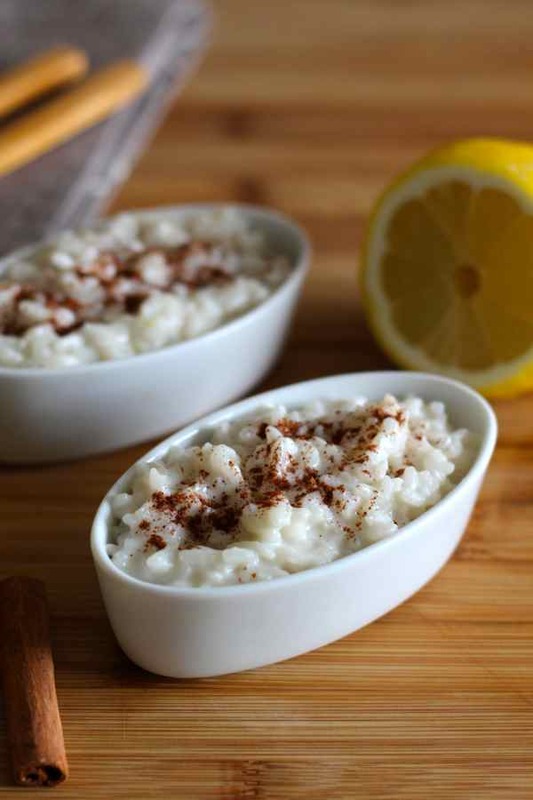 In a nutshell, rice pudding consists of rice (round, brown, black, basmati or other), milk (whole, coconut and/or cream), spices (cinnamon, ginger, cardamom, nutmeg, cloves), flavors (vanilla, lemon, red berries, orange, pistachio), sugar (brown, white or honey) and often includes egg. The rice pudding version of São Tomé and Príncipe only contains coconut milk and is divinely perfumed with lemon peel and cinnamon. Some recipes also include corn. I could not say it enough: rice is a healthy food. As I mentioned when I prepared my excellent chicken magbous from the Sultanate of Oman, Asians have the reputation of following a healthy diet and hold the record for longevity. Scientific discoveries have shown that rice was an almost perfect source of energy, with an ideal balance of protein, fat and carbohydrates. It is key to a healthy diet! I would not to say that rice pudding is a healthy recipe but almost! We had 8 hands to prepare this dessert from São Tomé and Príncipe as my friends Marie-Hélène, Nathan and Matias helped me. This was a first! Needless to say that it was executed very quickly and that we tasted it almost warm after a delicious Moroccan harira. Two perfect recipes as the 4 of us had a cold and had to stay inside that day as it was unbelievably cold in Paris. 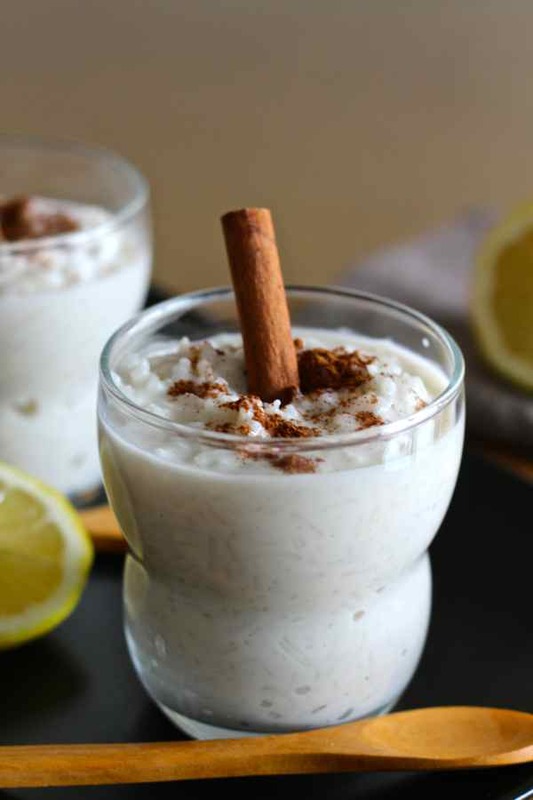 Arroz doce had the effect of a grog although flavored with coconut and with far fewer calories than a coquito! Arroz doce is one of the most popular desserts of São Tomé and Príncipe. 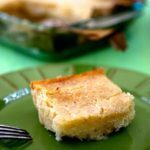 It is prepared with coconut milk and flavored with lemon and cinnamon. Cook the rice with a pinch of salt, the cinnamon stick and half the lemon zest, according to the instructions printed on the package. Once the rice is cooked, add the coconut milk, sugar, and remaining lemon zest. Bring to a boil and boil over low heat until creamy, gently stirring regularly, about 15 minutes. Remove from heat and serve in bowls. Sprinkle with ground cinnamon. Serve hot, warm or cold.